The US has warned the Hamas-led Palestinian government against defending "terrorist acts" after a suicide bomber killed nine in Israel. A spokesman called the bombing a "despicable act of terror" and said the Palestinian Authority was responsible for preventing such attacks. UN Secretary-General Kofi Annan called on the Palestinian Authority to take a firm stand against suicide bombings. 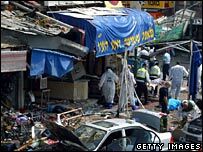 The blast at a Tel Aviv restaurant on Monday also left more than 50 injured. Militant group Islamic Jihad said it was behind the bombing. In the aftermath of the bombing, Israeli aircraft fired missiles at a metal workshop in Gaza City. The Israeli army said the workshop was used by Palestinian militants to make rockets. The White House said it had noted reactions "by several Palestinian terrorist groups, including Hamas, that defend or even applaud the barbaric acts of terror committed in Tel Aviv". "Defence or sponsorship of terrorist acts by officials of the Palestinian cabinet will have the gravest effects on relations between the Palestinian Authority and all states seeking peace in the Middle East," spokesman Scott McClellan said. Earlier, Palestinian leader Mahmoud Abbas condemned the attack, but Hamas, which has been keeping a truce with Israel since taking power in the Palestinian Authority, described it as an act of self-defence. Sami Abu Zuhri, the official spokesman for Hamas, said it was "a natural result of the continued Israeli crimes" against Palestinians. "Our people are in a state of self-defence and they have every right to use all means to defend themselves," he added. An Israeli Foreign Ministry spokesman, Gideon Meir, told the BBC he blamed Hamas. "Now, maybe, the hands are not the hands of the Hamas, but the voice and the ideology is the ideology of the Hamas," he said. US State Department spokesman Sean McCormack said the US was now seeing "the true nature of this Hamas-led government". He noted recent pledges from Qatar and Iran to give $50m (£28m) each in funds to the Palestinian Authority. "We'd like to seek a little clarity from the government of Qatar as to exactly what their intentions are," he said. UN Secretary-General Kofi Annan said he had urged Mr Abbas to take a firm stand on the issue of suicide bombing. He said he would host the Quartet - the US, Russia, the EU and the UN - in New York on 9 May to discuss the situation. Javier Solana, the EU's foreign policy chief, urged "all parties to prevent any new descent into a senseless spiral of violence". The Russian foreign ministry said in a statement it condemned the attack firmly and without reserve. Meanwhile, at a meeting of the UN Security Council scheduled before the suicide blast, the Israeli envoy called recent statements from some countries in the region "clear declarations of war". "A dark cloud is looming over our region and it is metastasising as a result of the statements and actions by leaders of Iran, Syria and the newly-elected government of the Palestinian Authority," Dan Gillerman said. But other nations criticized Israel. Malaysian Ambassador Hamidon Ali, speaking for the Non-Aligned Movement, condemned Israel for "excessive and indiscriminate use of force" against Palestinians. Palestinian UN observer Riyad Mansour condemned "the loss of innocent lives, Palestinian and Israelis", but urged Israel to end "flagrant and grave violations of international law".